I just can’t help myself with these kitschy holiday themed dishes!! This wreath shaped pull-apart bread made with gluten-free/grain-free Chebe bread is so super simple. It would make a tasty (and beautiful) addition to your Christmas appetizer table! Preheat oven to 375 degree Fahrenheit. Line a baking sheet with parchment paper. In a medium bowl, prepare Chebe mix according to directions. I typically use about 3 tablespoons of water for the dough so it doesn’t get too sticky. Knead the dough until it’s all well-combined. Cut into 12 equal parts and then roll those into balls. If you have a kitchen scale, you’re looking at about 28 grams each. If you don’t have a scale, it may help to roll it into a log shape and then slice it off into equal pieces. Place dough balls in a circle on your parchment paper lined baking sheet. Leave about ½ inch between each dough ball. I try to imagine I’m building a clock and place the dough balls where the numbers would be. Bake at 375 degrees for 20 minutes until lightly golden brown. Let cool completely. Mix together the cream cheese and 2 Tablespoons of dry ranch seasoning until smooth. Spread cream cheese mixture over wreath. I used about ¾ of the cream cheese mixture to cover the wreath. Note: You can use the leftovers as a dip for veggies or crackers. 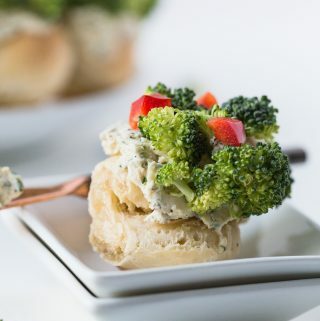 Layer the chopped broccoli over the top of the cream cheese mixture. I try to kind of push it down into the cream cheese so it has something to stick on. Then sprinkle the diced red pepper on the top. You can certainly buy dry ranch seasoning (there are about 3 Tablespoons per package). Or you can make your own! We use Gimme Some Oven’s dry ranch seasoning mix and it’s in our fridge at all times to pull it out when we need it! For the bow, take about ¼ of the remainder of the pepper and cut off the ends so you get a somewhat flat piece. Then “skin” the pepper using a knife so that you’ve scraped off most of the “meat” and just a thin layer of the skin is remaining. I found it easiest to cut out the top part of the bow and the tails separately. Then place them in the center on the top of the wreath! As with most of the Chebe mixes, you can really use them interchangeably. So for this recipe, you can also use the Garlic-Onion Breadstick Mix or you can use the All-Purpose Mix and replace the water with milk in the recipe.